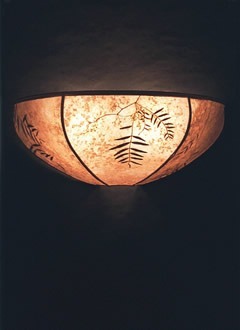 Wall sconces needn’t be bland, they can be full of life and can celebrate the world around us. 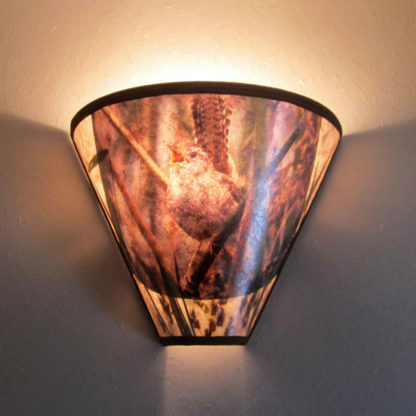 Local photographers Ken Skolnik and Dave McMullen have graciously allowed us to use their images of local Solano County birds, to which we’ve added “habitat”, with natural foliage appropriate to each, tall eucalyptus for the barn owl, nandina, whose flowers attract Anna’s hummingbirds, meadow grasses for the wren and yellow throat. Used singly, or in groups, sconces bathe your walls with light, and find uses in many areas of the home from the entry to the bedroom. This series of sconces uses photographs of Solano County birds and was created to honor the work of the Napa Solano Audubon Society and support the publication of their Solano County (CA) Breeding Bird Atlas. 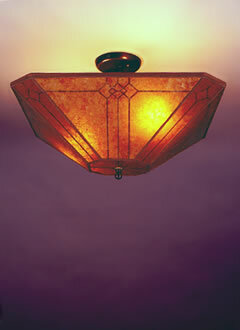 20% of all sales using these photos, including custom orders, will be donated to this effort. More information about Napa Solano Audubon Society and their Breeding Bird Atlas can be found on their website: www.napasolanoaudubon.com. The ½-hex mica sconce is 16″ wide and accommodates a pair of 60 watt bulbs (either small format incandescent, CFL or LED). 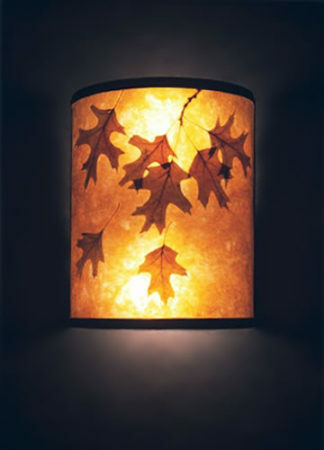 This is a good size for larger rooms, or for rooms with darker walls. 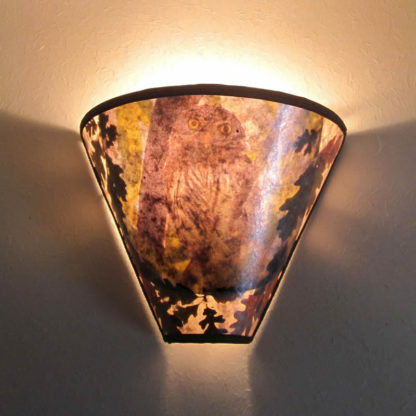 This ½-cone shaped owl mica wall sconce is 11″ wide and accommodates a single 60 watt bulb (either small format incandescent, CFL or LED). 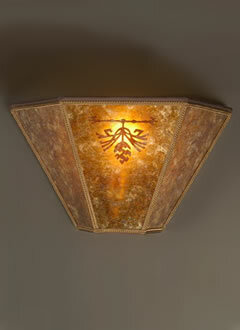 It provides ambient light and is particularly suited to entries, stairways and hallways. 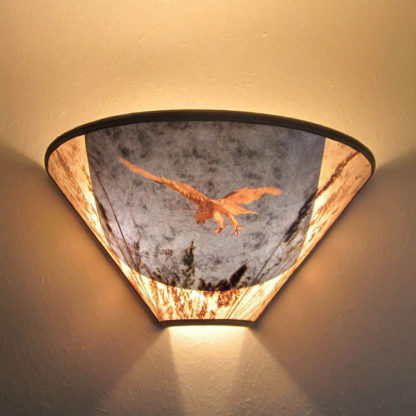 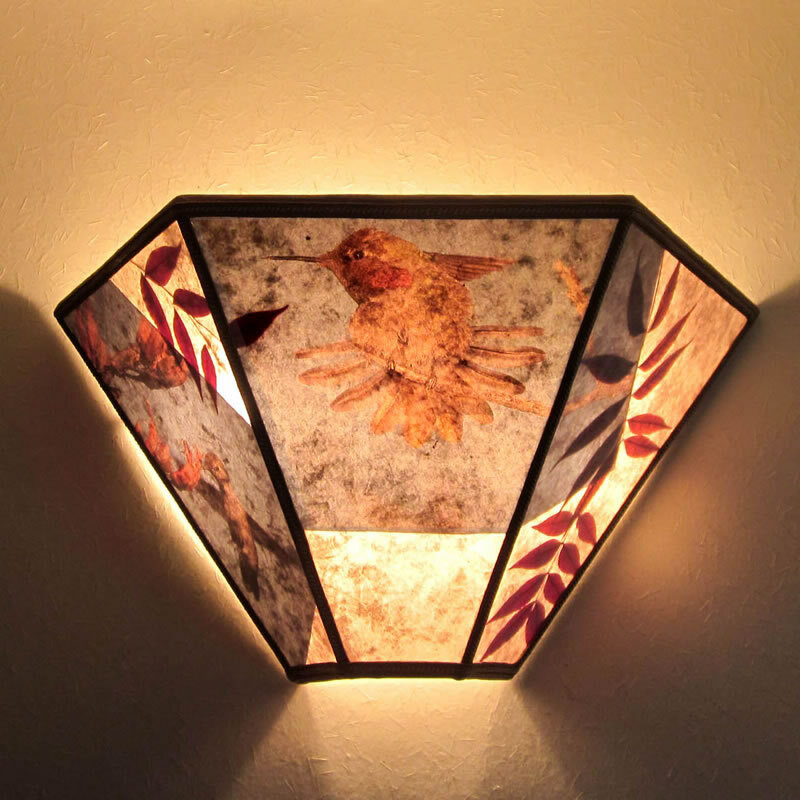 This ½-cone shaped owl mica sconce is 11″ wide and accommodates a single 60 watt bulb (either small format incandescent, CFL or LED). It provides ambient light and is particularly suited to entries, stairways and hallways. 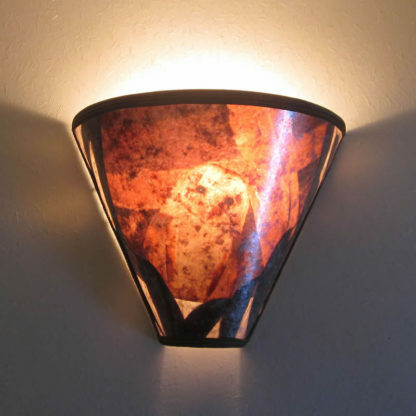 This ½-hex wall sconce is 16″ wide and accommodates a pair of 60 watt bulbs (either small format incandescent, CFL or LED). 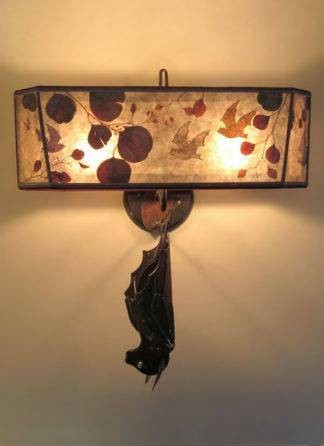 This is a colorful, bright sconce, with red Nandina, whose flowers attract this diminutive bird. 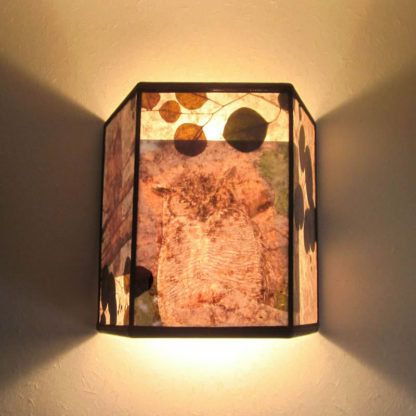 This box-shaped owl wall lighting is 10″ wide and can accommodate a pair of 75 watt bulbs (either small format incandescent, CFL or LED), bathing the wall in light. 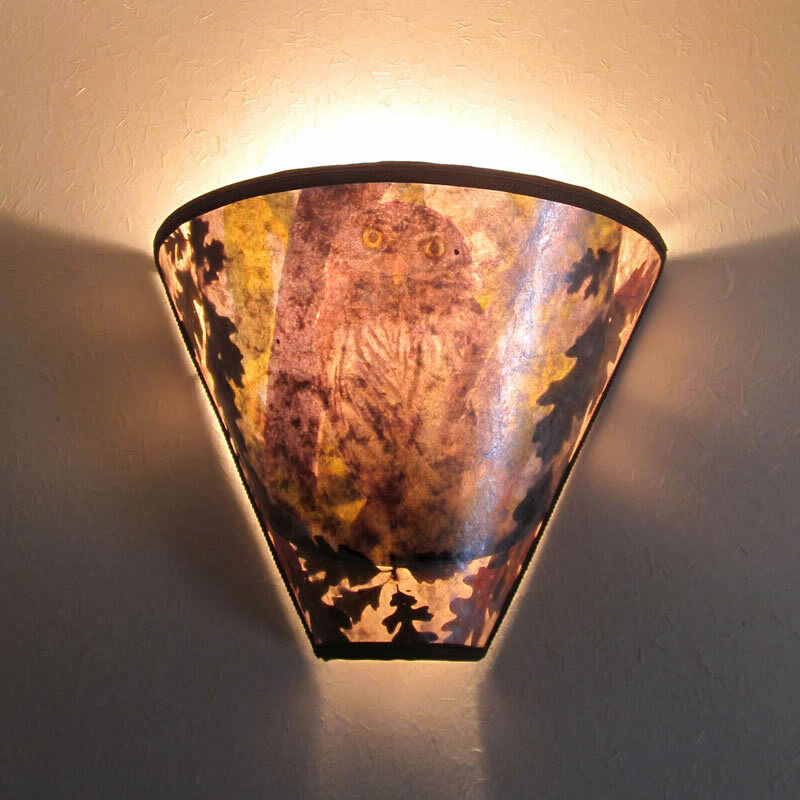 This ½-cone shaped owl wall light is 11″ wide and accommodates a single 60 watt bulb (either small format incandescent, CFL or LED). It provides ambient light and is particularly suited to entries, stairways and hallways. This ½-cone shaped mica bird sconce light is 11″ wide and accommodates a single 60 watt bulb (either small format incandescent, CFL or LED). 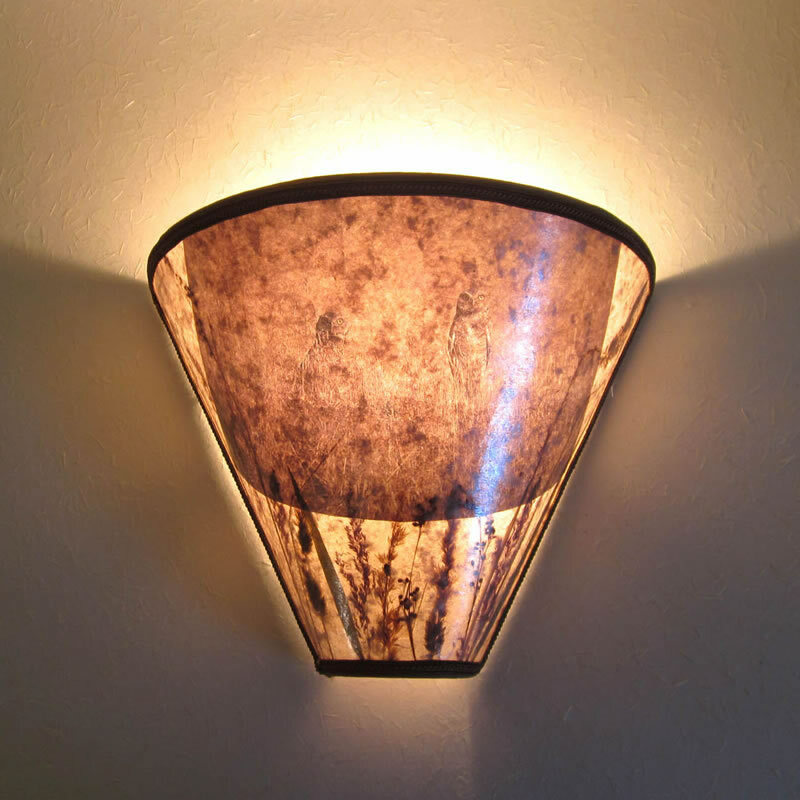 It provides ambient light and is particularly suited to entries, stairways and hallways. 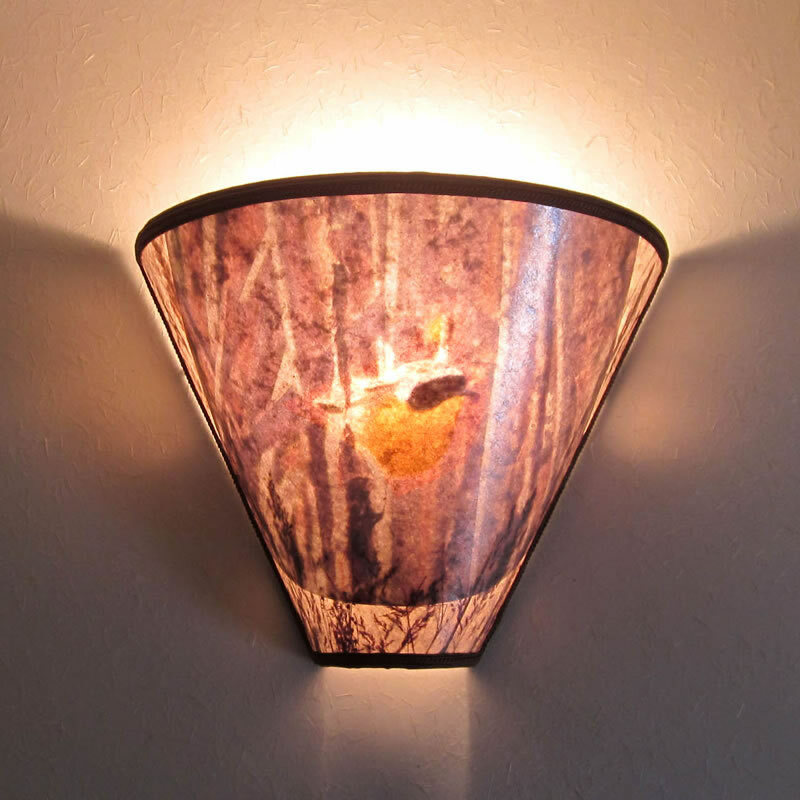 This ½-cone shaped Bird sconce is 11″ wide and accommodates a single 60 watt bulb (either small format incandescent, CFL or LED). It provides ambient light and is particularly suited to entries, stairways and hallways. 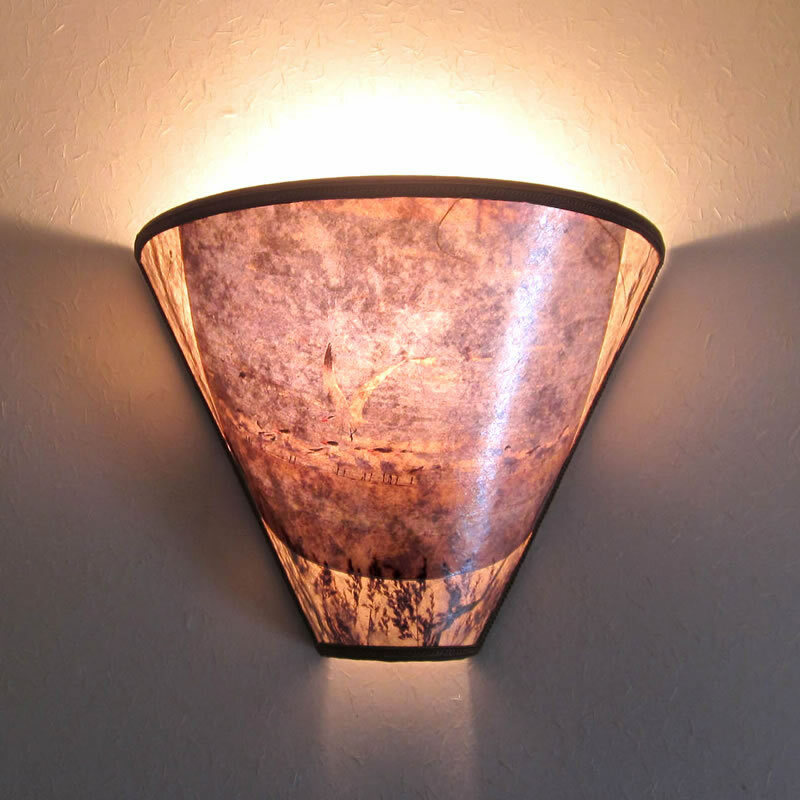 This ½-cone shaped mica sconce lighting is 11″ wide and accommodates a single 60 watt bulb (either small format incandescent, CFL or LED). It provides ambient light and is particularly suited to entries, stairways and hallways.